Introduces HTML tables, 2 list types and iFrames using a YouTube Video for an example. How to create a basic table structure. How to create a table with multiple columns. How to span 2 Columns with COLSPAN. How to span 2 Rows with ROWSPAN. How to add ordered and un-ordered lists. 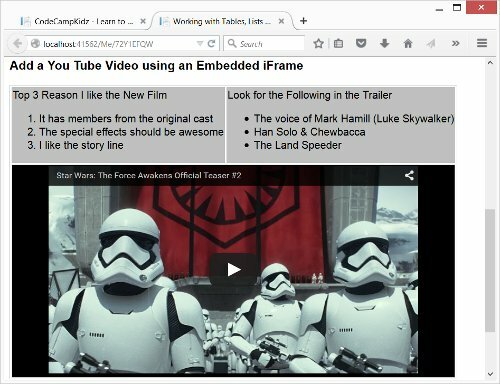 How to use an iFrame to embed content from another site (i.e. You Tube) on to your page. This is your first major project. Take as much time as you need to make it the way you want. Bring together everything you have learned so far and create a structured page using the HTML Table tag then fill the data cells with content (lists, videos, graphics, text manipulations, etc). Please submit a code review when you are finished. Please submit a code review when you are finished.